All you ghouls... oops, we mean Voxox fans, have spooked and surprised us! We asked you to get your creative cauldrons boiling and tell us what Boney Skellington was saying into his iPhone by posting on our Facebook wall, and the response we got was hair-raising! And now the winner has been chosen. "Bone jour!" - Jim K.
"I just got veneers!" - Natasha G.
"This diet app really works!" - Bill L.
"The call is coming from inside the house..." - Leti V.
"I'd love to go to the dinner party, but I have no BODY to go with." - Allison B. "I guess I just have to face it, women only like me for my looks..." - Michael C.
"Dr. Murray, you shouldn't have given me all that propofol!" - Erica B. "Good thing Voxox lets you send text messages, being a skeleton I lack the vocal chords and ear drum required for a phone call!" - Kevin H.
"I just looked at my land-line phone bill and it scared the life out of me!" - Adam D.
"Caller: What happened to your skull? Boney Skellington: Ooh! Doctor says its just a flesh wound!" - Akinboye J. "These roaming charges are killing me, maybe I should get with Voxox?!" - Thomas G.
"Doctor, doctor, give me the news, I've got a bad case of lovin' you... No pill's gonna cure my ill, I've got a bad case of lovin' you (Voxox)!" - Ian L.
"No, ma'am. Hopefully there won't be an emergency... we've only got a skeleton crew tonight." - Don R.
"I made a promise to myself to wait for the iPhone 5 no matter how long it takes!" - Michael C.
"Omigosh, I just saw Jenny from High Skull, she hasn't aged a day!" - Heidi S.
"No guts, no glory brah!" - Chris C.
"I see dead people." - Michael C.
"When I said I was dying to try out Voxox, I didn't mean it literally!" - Benjamin B.
Congratulations, Benjamin! 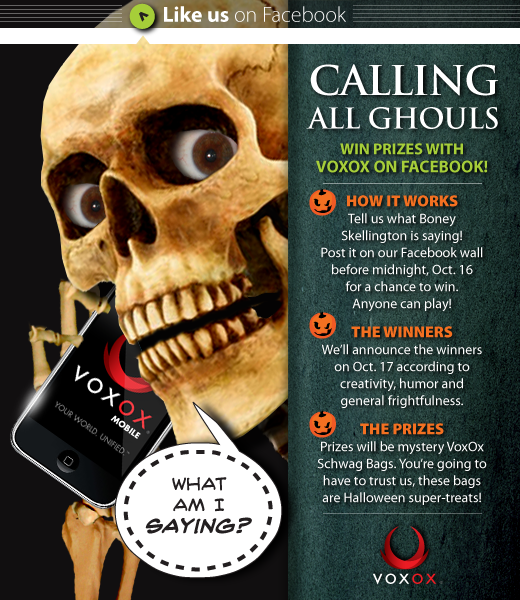 You'll be receiving a spooktacular Voxox Schwag Bag complete with your very own VoIP the Voxox Alien!! A BIG thank you to everyone who entered the contest! Don't be too grim if you didn't win, another chance to score Voxox schwag is coming up tomorrow with round two of our frightful Halloween contest series!! Come back here or visit our Facebook page tomorrow (Oct. 18) for more info... or else! Muahahaha! !